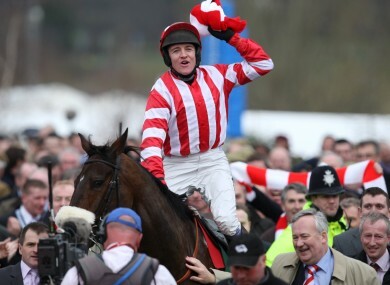 Irish chaser Forpadydeplasterer will not travel to this year’s festival, trainer Tom Cooper reveals. 2009 ARKLE CHAMPION Forpadydeplasterer has been withdrawn from this year’s Cheltenham festival amid concerns about his health, though trainer Tom Cooper remains optimistic that he will return in time to race at Punchestown. The 9-year-old had been pencilled in for the festival’s three major chases – the Ryanair Chase, the Queen Mother Champion Chase and the Gold Cup – at the declaration stage, but Cooper has since made the decision not to send him to England again. Today’s Racing Post features comments from Cooper who explains that Forpady was “a very sick horse” following his most recent trip overseas. The horse had initially travelled to Kempton on St. Stephen’s Day for the King George VI Chase which was then postponed due to weather conditions. It was only following his journey to run in the rescheduled race on 15 January that the full extent of his illness was noted. On that occasion, he was pulled up short of the finish in a race which was ultimately won by Nicky Henderson’s Long Run. Despite this disappointing performance, Cooper had been hopeful that the horse would recover in time for next month’s trip to Cheltenham. This morning’s comments indicate, however, that the Punchestown Festival from 3-7 May is now seen as the more realistic option. I thought last week we were looking good for Cheltenham but I’d rather not take him over again so soon. I’ll keep him over here for the rest of this season and hopefully he’ll be ready to run at Punchestown. Email “No Cheltenham return Forpady this year”. Feedback on “No Cheltenham return Forpady this year”.